These days I live less than a mile from the Mohawk River/Erie Canal, and which one it is at any given time is a distinction I wasn’t clear on until a few of us took a boat tour originating in the next town over, Herkimer. Having gotten lunch at the Waterfront Grill, we picked up our boarding passes and got on the Lil’ Diamond II and cast off. While the original canal was built between Buffalo (Lake Erie) and Albany(Hudson River) the barge canal system as it currently exists was built between 1905 and 1918 (it took a while) and all the lock mechanisms still in use today date from that time. Here comes the distinction between what is the Erie Canal and what is the Mohawk River: the canal and the river run together except in places where the river gets a bit too “natural” and shallow/twisty to make a good canal. In that case what is called a “land cut” was created, a separate channel where barge/boat traffic would travel until it was safe/practical to rejoin the Mohawk. There was then the problem that the water depth in the land cut was not the same as the river. That’s where the locks come in. We were only on the river a short while before we entered one of those land cuts, terminating in Lock 18. 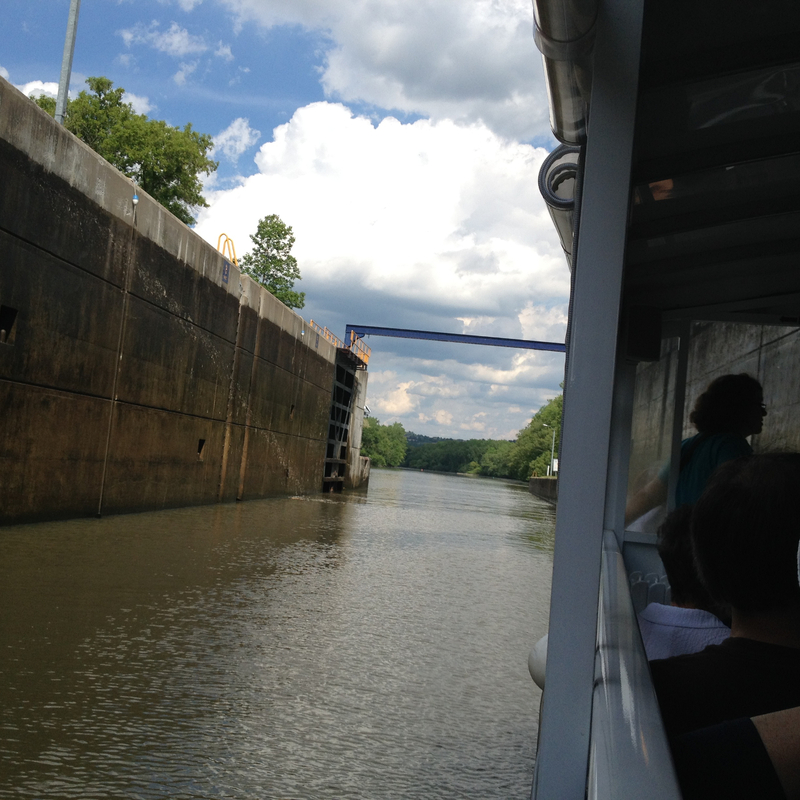 Here we are entering Lock 18. The building in white would have housed the original power-plant for the lock, since there was no grid at the time, though it has since been converted. The Lock doors are visible straight ahead. All boats entering need to moor to prevent jostling. We were the only boat in the lock on our trip down, however on the trip back up we were joined by five other boats, some rather bigger than we were, and it got a bit crowded. Once we were secured, the rear doors of the lock closed and the water level started to drop as we were being matched with the Mohawk again. You can’t see them in this picture, but steel mooring cables run from the top down the canal lock sides, and boats moor with sliding hooks so they can move up and down freely as the water level changes. 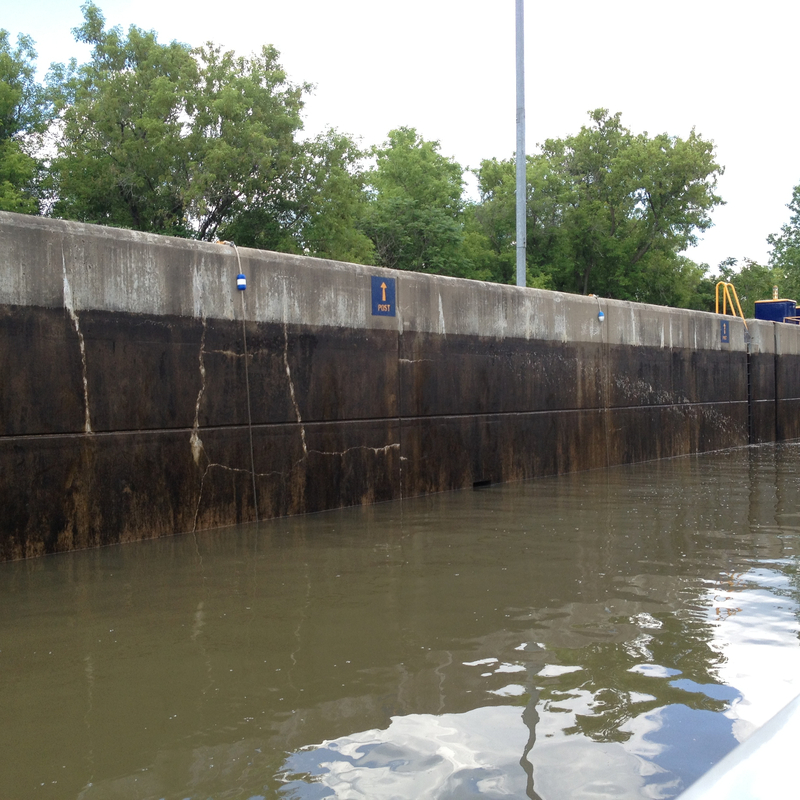 The difference was about 20 feet, as you can see now that the lock doors have been opened to let us on our way. Beyond this point we’re back in the Mohawk, at least for a while. We’ll turn around soon to come back to Lock 18. I wish the cruise had continued to Lock 17 at Little Falls; it has a vertical lift of 40 feet, which for many years was the largest of any canal lock in the world, even the Panama Canal. It’s since been dwarfed by one in China, with a vertical lift of 250 feet. 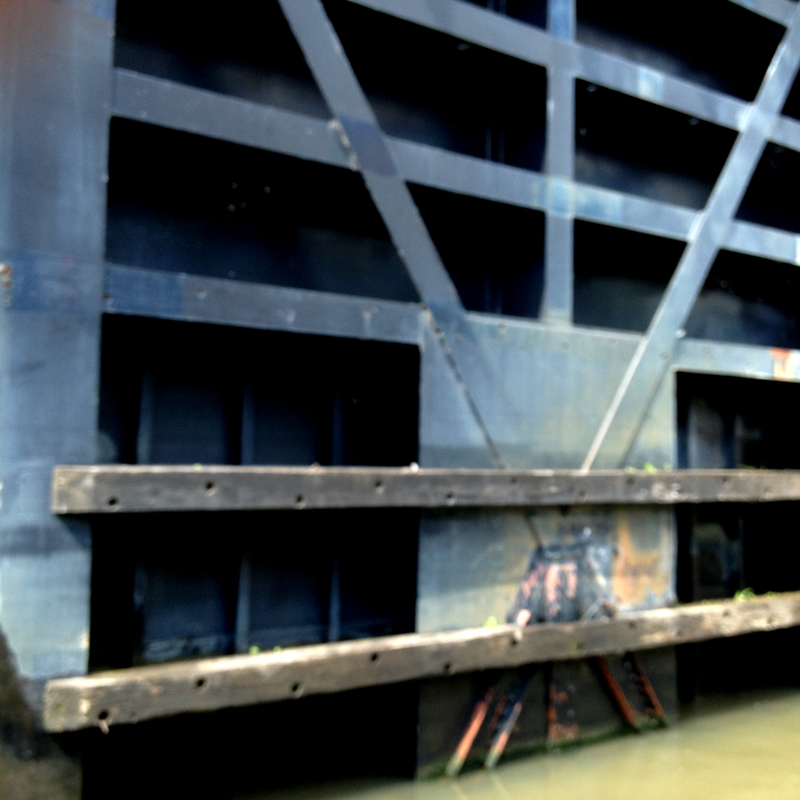 Here’s a close-up of one of the lock gates, which fits into the canal wall when open, to give the boats more room. It’s of steel, except for the two lower beams which are white oak. They are replaced about every fifteen years. 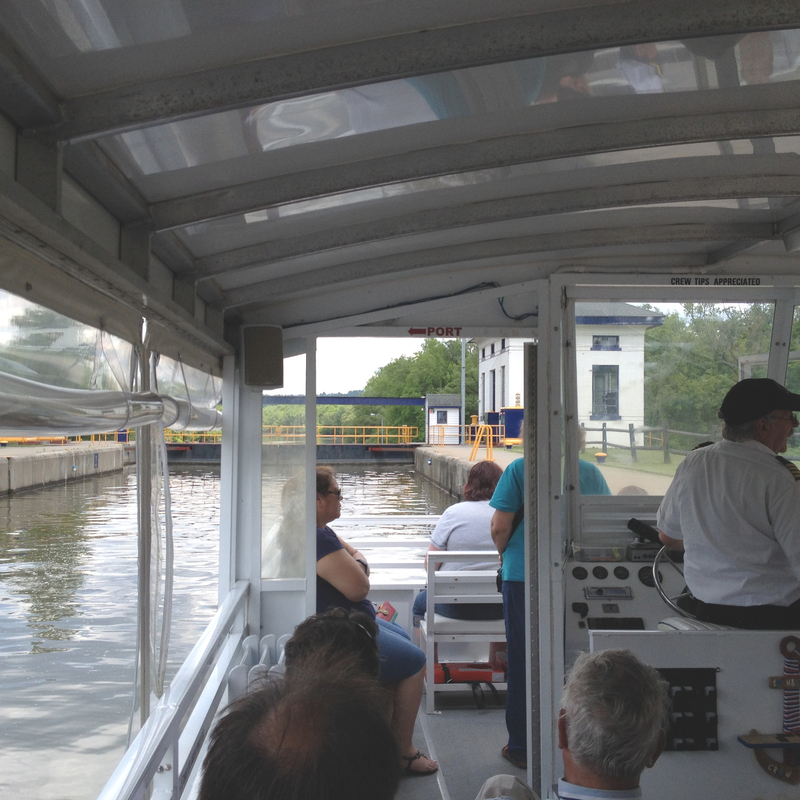 Most of the river traffic these days consists pleasure boats who pay a yearly fee for the use of the locks. They’re divided into “locals” and “loopers”. The term Locals is pretty self-explanatory. Loopers are ones who travel a great canal circuit through as many waterways as they can before returning to where they started. Sort of like a road trip, except on the river/canal. Must be fun, if you’ve got a fair sized boat and nothing else to do. 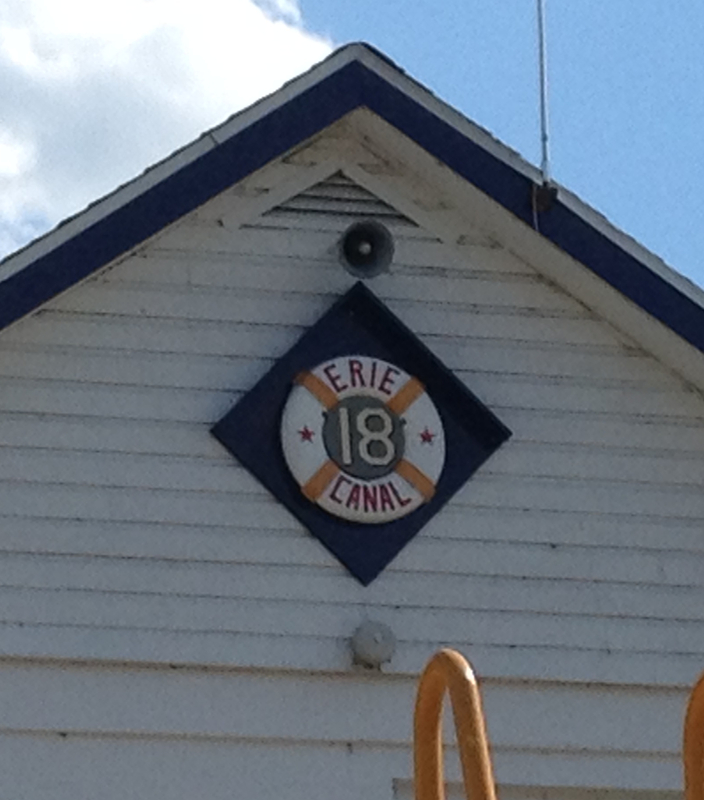 This entry was posted in real life and tagged Erie Canal, Herkimer., Little Falls, Lock 18 by ogresan. Bookmark the permalink.